You may have heard by now of Officer Mathew Hickey of Marietta, Ohio. 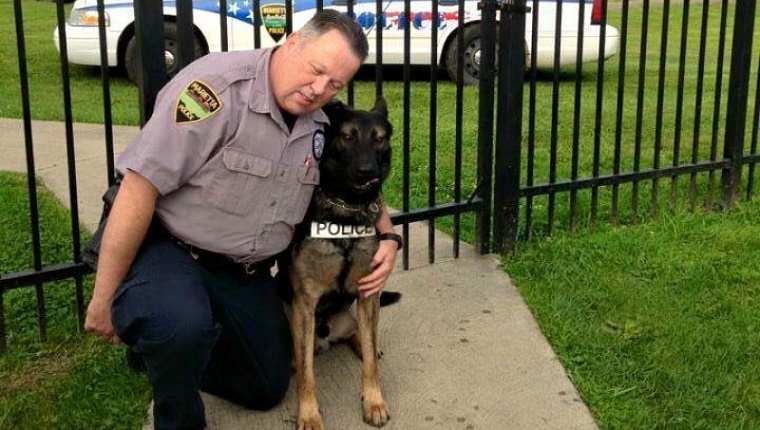 He’s a retired police officer who worked with a K-9 partner, Ajax. Like many of us who work closely with dogs, he became quite attached to his police dog companion. He spend every day for three years working with Ajax, and the pair formed quite a bond. The time came, after thirty years of service to the police department, for Hickey to retire. But he didn’t want to give up his buddy Ajax. Hickey saw Ajax as family, like one of his own children. So he offered to buy the dog from the city for $3,500. But the city wouldn’t allow it. By law, Ajax is property of the city and can only be sold at auction. As the situation was reported, Hickey received waves of support from the community and from people over the internet. A GoFundMe campaign was launched to raise $3,500 to help buy Ajax, but has so far drawn in over $65,000 in donations at the time of writing this post. Hickey was touched by the outpouring of kindness. He claims that even though he felt jaded from his work as an officer, he feels like a changed man. It looks like Hickey’s chances of getting Ajax are very high now, and Ajax will be able to share his retirement in a home where he is loved. UPDATE: Officer Hickey was officially able to buy Ajax from the city for the price of $1, which is the same deal offered to handlers when a K9 dog is retired from the service. The money from the GoFundMe campaign will be donated to Vested Interest to provide bulletproof vests for K9 unit dogs on the job. This story turned out to have a happy ending for Ajax, Officer Hickey, and several K9 dogs who will have extra protection while doing their dangerous work.